Chapman was born on January 10, 1938 in China Grove, North Carolina. He is a graduate of the Moody Bible Institute and holds a Bachelor of Arts (B.A.) and Master of Arts (M.A.) degree in anthropology from Wheaton College and from Wake Forest University. He also received Master of Religious Education (M.R.E.) and Doctor of Philosophy (Ph.D.) degrees from Southwestern Baptist Theological Seminary. As he was about to leave as a missionary in Nigeria, his wife got sick. He joined the staff of Calvary Baptist Church in Winston-Salem, North Carolina, in 1971 and shares the responsibilities of teaching and family care. Chapman speaking at a conference in 2010. The first of many books promoting the above concept was The Five Love Languages: How to Express Heartfelt Commitment to Your Mate, first published in 1992. The book has sold over 11 million copies in English; having been translated into 49 other languages and the 2015 edition consistently ranks in the top 100 sellers on Amazon.com, ranking in the top 50 as of February, 2007. It also consistently ranks in the top 5 books on the New York Times bestsellers list, claiming the #1 spot at times. He is perhaps best known for his concept of "Five Love Languages", helping people express and receive love as expressed through one of five languages: words of affirmation, quality time, receiving gifts, acts of service, or physical touch. Chapman argues that while each of these languages is enjoyed to some degree by all people, a person will usually speak one primary language, but all are important and can be ranked after taking the love language profile. He has also authored the Five Love Language concept books for parents of children and teenagers, single adults, and a special version for men. He has co-authored The Five Languages of Apology with Dr. Jennifer Thomas, which focuses on giving and receiving apologies. Additionally, Chapman co-authored The 5 Languages of Appreciation in the Workplace with Dr. Paul White, applying the concepts to work-based relationships. Chapman travels the world presenting seminars on marriage, family, and relationships, and his radio programs air on more than 400 stations. He is married to Karolyn J. Chapman. They have two adult children, Shelley and Derek. 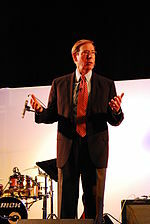 Gary Chapman (2004). The Five Love Languages: Singles Edition. Northfield Press. ISBN 978-1-881273-87-5. Gary Chapman (2009). The Marriage You've Always Wanted. Paperback: 160 pages. Moody Publishers; 1 edition (July 22, 2009). ISBN 978-0802472977. 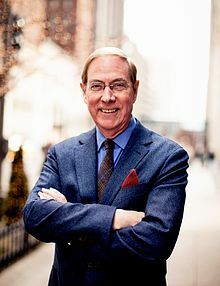 Gary Chapman (2010). The 5 Love Languages: The Secret to Love That Lasts. Northfield Press. ISBN 978-0-8024-7315-8. "The Five Love Languages Explained"
This page was last edited on 23 March 2019, at 21:44 (UTC).